Are you bored of usual horizontally aligned tabs button at the top of Google Chrome browser? Extensions can be used for lot of fun with Chrome like flipping webpages upside down or add background to Google search. Vertical Tabs Chrome extension allows you to view all opened tabs in vertical direction using button at top right part of the Chrome. Download Vertical Tabs extension and then click the vertical tabs button at top right. 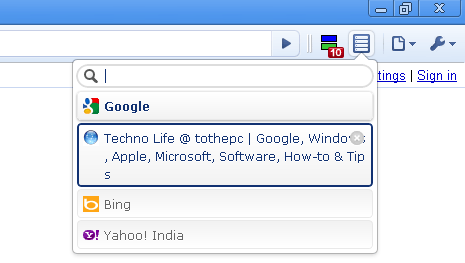 It will show pop-up with search box at the top, followed by listing of opened tabs in vertical direction. Interested?